A PENSIONER flagged down a bin lorry for help after being attacked in the street, a murder trial heard today. Cleansing worker Paul Donohoe, 54, told how he and his two colleagues were told by John Baker “I’ve been stabbed”. Mr Donohoe said his colleague phoned an ambulance for the injured man who called out words to the effect: “I’ve got a bad heart, I can’t breathe right” before passing out. One of the workmen can be heard on a recording to the emergency services saying there was “blood coming from his mouth” and “I can’t feel a pulse”. Mr Donohoe was giving evidence at the trial of Peter Telfer who is accused of murdering 76-year-old Mr Baker on June 29 last year in Calton, in Glasgow’s east end. Telfer is also accused of assaulting and attempting to rob shop worker Owaisuddin Siddique at the Day-Top on Shettleston Road and carrying a knife on June 24. He also faces a string of charges including behaving in a threatening or abusive manner at various streets in Glasgow city centre and assaulting and robbing two women of their handbags, on June 28. The 25-year-old allegedly attempted to defeat the ends of justice as well being charged with possessing cannabis. Mr Donohoe said around 12.30am he and his colleagues were working on Abercromby and as they began to drive away were flagged down by a man in the middle of the road. He told the court the man said “I’ve been stabbed” and added: “He looked like he was in pain”. He said by the time they got out the car the man had “fallen to the ground” and his colleague Alan Miller asked Mr Donohoe to get his phone then support the injured pensioner. Mr Donohoe told jurors “he was leaning against my legs”. The court was told that he appeared “seriously injured” and that the man “passed out” while Mr Miller was on the phone to the ambulance service. A recording of the 999 call made by Mr Miller was played to jurors, other voices can be heard in the background. One person was heard to say there was two wounds on Mr Baker’s back and that he has “trouble breathing”. The operator is told he is “spitting up blood”, that he is “losing consciousness” and “I can’t feel a pulse”. Telfer denies the charges and the trial before judge Lord Matthews continues. Sometimes I think March should be called the ‘don’t bother to travel’ month. The weather can catch us out, of course, with an unexpected dump of snow, but that usually only disrupts for a few hours. It’s the ­sudden sprouting of roadworks all over the place that cause cumulative irritation and the desire to see entire cone armies consigned to the ­nearest landfill. Quite why councils ­discover every year that they have underspent their roads ­budget and now need to blow it all at once or lose it, is a mystery. And the ‘use-it-or-lose-it’ imposed on the councils, at the one time in the year the road maintenance contractors have them over a barrel, is equally a mystery. But even when the cones are gone, mysteries about how our road system ticks – or doesn’t – abound throughout the year. Take our dearly loved M8, for example. Welcome though the final link between Newhouse and Baillieston is, won’t it simply push the problem elsewhere? On a road which is as congested as the M8, one would hope that proactive management of the inevitable knock-on effect has been well planned. But the omens don’t seem to be too good. A straw poll of regular M8 commuters would probably reveal an expectation that the two-lane section westbound from Livingston will increasingly become the next major bottleneck. Over recent years, as the ribbon development feeding onto the motorway has expanded, each new ­distribution warehouse has added several hundred delivery journeys per day to the mix. The concept of the M8 as a commuter ­corridor has become something of a joke. Even at 6.30am, it is ­rarely possible to avoid being caught behind lorries ­playing leapfrog with a speed ­differential of barely a few miles an hour. As most of us have ­experienced all too often, such overtaking can require a significant amount of time and ­distance to achieve. The result? A seriously backed-up queue of traffic and ­soaring frustration levels that are bound to increase the risk of an accident. The mystery in this case is why some sort of intelligent traffic management has not long since been in place in the worst bottlenecks of the ­two-lane sections. So here’s an off-the-wall suggestion: ban HGVs/LGVs from the outer lane on the uphill drag from Harthill Services through to the start of the new three lane section at Junction 6 between, say, 7.00am and 9.00am. Relocating two or three of the Automatic Number Plate Recognition cameras once the Newhouse to Baillieston section is completed could alert police patrols to ­vehicles breaching such a ban, or ­trigger an automatic ticket. Road space is now such a scarce and valuable resource that continuing to delegate the management of its use to the survival of the biggest is clearly a flawed concept. But, regrettably, it’s a ­concept that there seems ­little prospect of being abandoned until and unless there is a sea-change in road ­management thinking. Iain A. Masterton is a retired consultant software engineer. He lives in West Lothian. 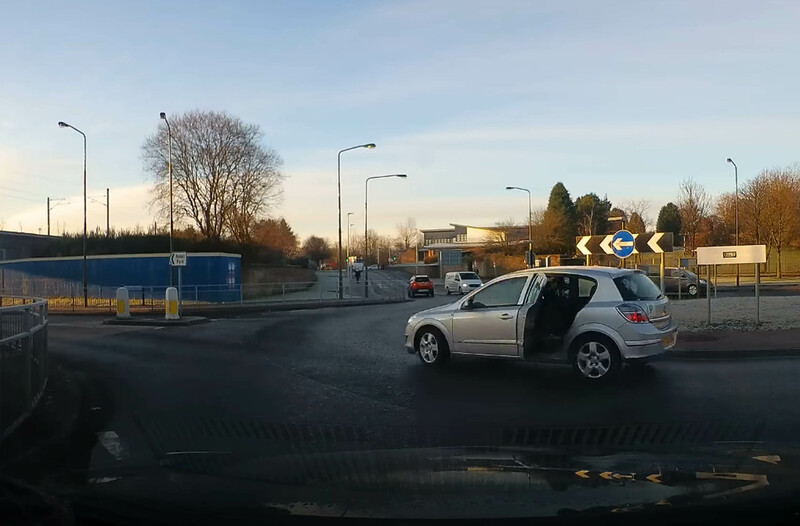 BIZARRE footage shows a recently-qualified driver negotiating a roundabout after apparently forgetting to shut the back door. The driver – proudly displaying a green “P” after passing her test – turns right with the passenger-side rear door wide open. The startled motorist filming the scene on his dashcam can be heard exclaiming “Holy s***!”. The driver of an HGV approaching the scene flashes his lights frantically to warn the driver of the danger. Thankfully, the new driver seems to realise her vehicle is unusually well-ventilated and appears to pull over after leaving the roundabout in Bathgate, West Lothian. The clip was taken just before nine o’clock this morning (mon), and the man who took the footage believes the driver had probably just dropped their children off for school. The dashcam owner, who does not want to be identified, but runs the Scottish Dashcammer Facebook page, said: “I’m guessing the lady had dropped kids off at school and I’m presuming the door hadnt been fully locked tight. I can only assume that as there is a school directly opposite. “My reaction, as you can hear from the audio was more worried about if the door would hit the footpath railings. A spokeswoman for road safety charity Brake, said: “Drivers need to ensure that their vehicle is fit for the road every time they get behind the wheel; this includes making sure all passengers are secured with a seatbelt, and doors and boots are firmly shut. The girlfriend of a thug who attacked her father with a hammer shouted “happy?” at her mother as the boyfriend was jailed today. Garry Kerr, 36, left John Archibald permanently disfigured after the father became concerned about his daughter Claire’s welfare. A jury today rejected his ‘self defence’ claim and returned majority verdicts finding him guilty of repeatedly striking the HGV driver on the face and head with the weapon and having a hammer in public. Tatooed Kerr, of Livingston, West Lothian, was remanded in custody while social workers investigate whether he should be subject to post release supervision to protect the public. As he was led to the cells his girlfriend stormed out of the court and shouted: “Happy?” at her mother, who burst into tears. Sheriff Peter Hammond said he was revoking bail because of the seriousness of the charges and Kerr’s criminal record, which includes previous convictions for assault and robbery, contempt of court and attempting to pervert the course of justice. Mr Archibald said he had become concerned about the welfare of his daughter Claire, who lives with Kerr, after being told about a post on social media which was quickly taken down. He repeatedly phoned his daughter’s mobile number but said Kerr always answered, shouted abuse at him and refused to let him speak to her. He said headed for the couple’s flat in Livingston to try and speak to her. When he got there he saw Kerr holding something under each of his hands as he swung himself over a fence towards him. Mr Archibald said: “Whatever he had in his hand he swiped to try and hit me. “I jumped back and bent forward a bit and he hit me in the eye with something hard. “I couldn’t see what it was but obviously he split my left eye. It was quite heavy force. “I put my hand over my eye because it as bleeding. I just felt cold things hitting me on the head like scratching and cutting. “Then he hit me twice on the head with the hammer. I’m not sure if it was a hammer but it felt cold and made of metal. “I was crouched down holding my eye with my right hand trying to defend myself with my left. It was heavy force. It shocked me. He added that he saw he had cuts and round marks on his head “the shape of a hammer head” when he was treated at hospital. He also suffered a snapped tendon in his right arm as a result of one of the blow’s inflicted by Kerr, he said. Kerr had pleaded not guilty to two charges of carrying weapons during the incident near his home on 1 April this year. Specialist bulk powder haulier Arclid Transport has expanded its fleet with the company s first Iveco: a Stralis Hi-Way 6 2 tractor unit featuring Iveco s patented HI-SCR engine technology. The Stralis joins a fleet of 31 at the Sandbach, Cheshire-based firm, and will be used for the transportation of granular raw materials, minerals and bulk powders destined for the UK s construction industry, as well as firms manufacturing pottery and glass, chemicals and detergents and animal feed. Transport Manager Peter Conway says: We were looking to expand our fleet, and having heard good things from a number of other Iveco operators regarding fuel performance and low total cost of ownership, we were eager to try a Stralis for ourselves. Iveco s HI-SCR engine technology was another key feature that drew us to the Stralis, adds Conway. Being able to meet the stringent Euro VI emissions limits without a need for exhaust gas recirculation or regeneration is a clear winner in terms of increased productivity and reduced downtime, while the lack of driver involvement in the process allows our staff to keep their minds on the job delivering excellent, on-time customer service. Iveco dealer Sherwood Truck and Van finalised the deal, and Arclid Transport s new Stralis Hi-Way (AS440S50TX/P) is expected to remain a part of the company s fleet for five years, travelling approximately 60,000 miles annually. The new 6 2 tractor is powered by a highly efficient Iveco Cursor 13 engine. Capable of producing up to 500 hp between 1,600 and 1,900 rev/min, the engine provides up to 2,300 Nm of torque between 900 and 1,525 rev/min. The vehicle also benefits from the proven EuroTronic automated gearbox, manufactured for Iveco by ZF. Further enhancements specified by Arclid Transport include alloy wheels and leather seats in the truck s spacious and comfortable sleeper cab a cab designed with a drag-reducing aerodynamic profile, helping reduce the company s fuel bills. The addition of Iveco s latest Fuel Efficiency Package completes the new arrival a system incorporating technologies designed to further cut Arclid Transport s running costs. These include an Eco-Roll function that constantly monitors the road angle, looking for opportunities to shift into neutral on downhill stretches, before re-engaging a gear at the end of a descent for normal operation. Meanwhile, a new engine oil management system reduces energy absorption within the oil pump and provides faster warming of the engine, coupled with OW-20 low viscosity engine oil to further boost engine efficiency and stretch oil service intervals. Founded in 1972 with one tanker, Arclid Transport was first established to transport foundry sand for associate company Bathgate Silica Sand. Six years and 10 vehicles later, it became apparent that demand for professional haulage services was growing, so a larger tank was purchased to allow for the carriage of a variety of materials. Today, as part of the Archibald Bathgate Group, Arclid operates a fleet of vehicles and provides haulage services for clients across the UK.